I gave my facebook fans a preview and tease of this delicious recipe last week. These muffins are just incredible. If you love the taste of Chai tea, you will want to make time to give these a try. The base recipe is from Cooking Light. I added the banana to it which actually compliments the flavor of Chai tea beautifully and makes an incredibly moist muffin. My son had requested a muffin with the flavors of Chai tea, and after a brief recipe search on google, I found one I wanted to try. Not only do these muffins have the taste of Chia tea, they actually have Chai tea in them! Other recipes I found had you mimic the spices in Chai tea or brew the tea and add the liquid, but this recipe was different from all the others I found. You open up two tea bags and add the contents right into the flour. I knew I wanted to give it a try. I followed the original recipe exactly, except I added 2 mashed ripe bananas to the liquid portion, used sliced almonds on the top instead of pistachios, and omitted the drizzle of glaze on top. I love the speckled appearance from the tea and the bananas. You can definitely taste the Chai tea spices in the background...and you get a little heat from them. Nice. 1. Preheat oven to 375 degrees F. Spray wells of muffin tins with cooking spray or line with paper muffin cups. 2. In large bowl, combine the flour, brown sugar, baking powder, baking soda and salt with a whisk. Cut open the tea bags and add the contents into the flour mixture. Whisk it into the flour. Create a well in the middle of the flour mixture. 3. In a medium bowl or large glass measure, combine the buttermilk, melted butter, vanilla extract, and the egg. Stir in the mashed banana. Pour the this liquid into the flour mixture and stir until just combined. 4. Portion out into 16 muffin tins. Top each muffin batter with a few sliced almonds. Bake in 375 degree F oven for 15 minutes or until toothpick inserted into center comes out clean. Cool for 5 minutes in pan, then remove muffins to wire rack to cool completely. These muffins were insanely moist and so delicious. You really cannot tell they are low fat and lower calorie at all! The banana flavor really compliments the chai tea flavor. The chai tea doesn't over power and is just right. I loved the bit of almond crunch on the top. I will most definitely be making these again. Such a nice treat for 4pp. Well, we got my daughter all settled into her summer home in Milwaukee. I had never been to Milwaukee before. Quite a nice city. It was chilly over the weekend, but in hindsight, it was probably a good thing with all the moving we did. If I had known having teenagers and young adult children meant so much moving...I might not have signed up for the job! haha But no, I am really very proud of all my daughter's endeavors and accomplishments...it's a small price to pay and I will support her in whatever she does. Kohl's is paying her, paying for her housing for the 10 weeks, and paying for her parking...so who can complain? Hubby and I decided to stop in Chicago on the way home. Weather was yucky, but no rain. We had the most delicious deep dish pizza for lunch at Lou Malnati's then enjoyed some time on the Navy Pier before we headed home in POURING rain!! But we made it home safely and now I am playing "catch up" with my week!!! Congratulations to your daughter on her new endeavor! And congrats to you for being such a great Mom! Your kids are lucky Renee. Have a wonderful day. thank you Roz! Such kind words!! You have a great day as well! I've made chai banana bread and chai banana coffee cake so I totes agree with banana being a great compliment to the chai flavors! Loves it. These sound awesome! And I love muffins b/c they're automatically portioned. Makes it harder to accidentally cut yourself a slice the size of half a loaf. lol! Muffins are definitely portion control! Sometimes lowfat can be dry, but not these. it really does give a delicious spice flavor, doesn't it? Congratulations to you daughter Renee, it sounds like a wonderful summer for her. Yes, these kids do create a lot of work for us parents! They are so worth it and what would we do with all of our time without them? I don't ever want to know. The muffins sound amazing - you are such an accomplished baker. Love the photos. I love chai spices! 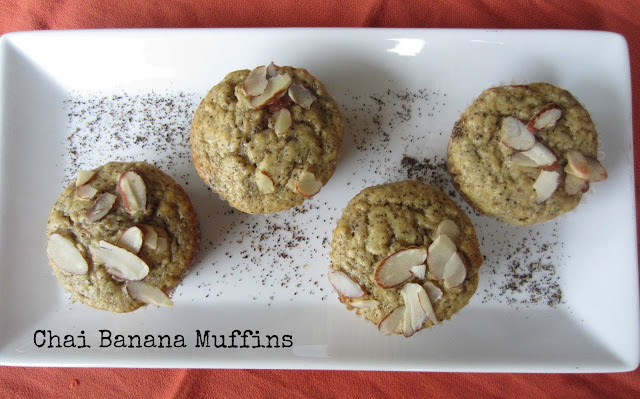 This looks like a great twist on classic banana muffins. Me too, and I love that this uses actual tea in it! Thanks for stopping by!